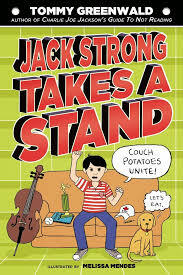 When his dad refuses to allow Jack to drop some of his extracurriculars, Jack goes on strike. He refuses to leave the couch for anything - school, activities (he makes an exception for food and the bathroom.) His father refuses to bend, thinking he is doing the best for his son. Jack’s strike soon gets the attention of his friends and the larger community. A local TV show decides to interview him - leading to a hilarious circus.